Art History students dug into the College’s archives to curate a photography exhibition that opened on Wednesday. 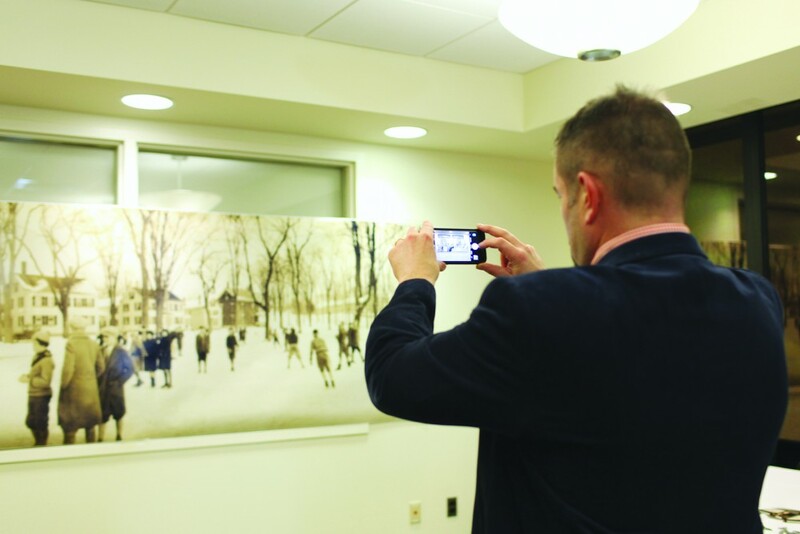 Each student in Assistant Professor of Art History Dana Byrd’s “Snap, Shoot, Instagram: A History of Photography” class presented collections of photos inspired by a specific theme in the history of photography on the second floor of Hawthorne-Longfellow Library. The class’s concentrations ranged from the evolution of photographic technology to the representation of women and indigenous peoples. Although Byrd has taught the course three times, this is the first time she has incorporated a curation project. “[Students] translated ideas that may be deeply involved with theory into something that anyone walking by a case can begin to understand by looking at the objects,” she said. After selecting their themes, students worked with Special Collections Education and Outreach Librarian Marieke Van Der Steenhoven to explore the George J. Mitchell Department of Special Collections and Archives and selected between two and five books, photographs or other items relating to their theme. Many students had never used Special Collections before taking the course, and Van Der Steenhoven hopes that the exhibition will encourage those students to come back and to invite others in. “One of the things that I find really exciting about Special Collections here at Bowdoin is that our collections are incredibly diverse and they are here for the students to use,” she said. Special Collections houses over 50,000 rare books as well as the manuscripts of more than 300 families and individuals. “Getting to go through all the different sources was really interesting, and to see the sheer volume of objects in the collection is really impressive,” said Ethan Bevington ’19. After looking through the artifacts in the Special Collections reading room, students wrote labels and texts for the pieces they chose to display. Some students found the process of consolidating all of their research into a paragraph under 200 words to be challenging. Byrd hopes that students’ descriptions and curatorial work will teach visitors to the exhibit about the history of photography and encourage them to consider the art form in new ways. “It’s nice to kind of see the texture of the real object, to look at different historic photo processes as they change over time, to look at different sizes: all of the sort of things you lose by looking at a digital image or a JPEG,” Byrd said. The opening of “Shoot, Snap, Instagram” also featured a ‘selfie station’ of enlarged reproductions of photographs from the college archives as they relate to the various themes relating to the history of American photography. The exhibit will be on display until the end of the semester in May.